The invention relates to a firmware update-write system and method. The firmware update-write method comprises the following steps of: configuring firmware update-write parameters including firmware update-write times; carrying out the firmware update-write on a base plate management controller according to the configured parameters; judging whether firmware update-write operation is qualified or not; when the firmware update-write operation is qualified, carrying out statistic on the firmware update-write times; and recording information of firmware update-write at each time to generate a journal file when statistic times are consistent with the configured firmware update-write times. The invention further provides a firmware update-write system. According to the firmware update-write system and method disclosed by the invention, a tester;does not need to stand by the side of a test machine table, a manual test can be completely eliminated, a program automatically senses starting time and finishing time of the firmware update-write of a BMC (baseboard management controller), associated firmware update information is automatically saved after a file is specifically saved and the tester can conveniently search the file. 本发明涉及一种分位刷写系统及方法。  The present invention relates to a sub-bit brush writing systems and methods. 在服务器产品进行研发过程中，基板管理控制器（Baseboard ManagementController,BMC)作为需要进行严格测试的一部分，需要对BMC中的分位（Firmware)进行反复刷写（即更新分位的版本，将BMC中的分位版本刷新到另外一个版本，之后再重新刷新到原来的版本，如此反复若干次），更新分位中的配置信息，以测试分位刷写是否合格。  R & D process, BMC (Baseboard ManagementController, BMC) as part of the need for rigorous testing, the need for BMC in the quintile (Firmware) repeatedly flashed (ie, an updated version of the sub-bit server products , the sub-bit version of BMC refresh to another version, then re-refresh to the original version, so repeated several times), update the configuration information quintile to quintile brush writing test is qualified. 而当前对分位进行刷写采取的方法存在很多问题：第一，整个分位刷写过程全部通过手动来完成；第二，无法准确的判定程序的开始和结束时间，只能通过人工计算程序执行的大概时间，利用测试人员的经验来判定刷写时间长度是否正确；第三，不同分位版本、不同配置模式之间的分位刷写需要手动执行；第四，手动检查的信息过多,对测试人员的要求很高,失误在所难免；第五，对分位进行多次刷写时，在不同版本之间的不同模式之间切换，测试人员要长时间守候在测试机台旁，需要不断的检查初始化信息，耗费大量人力并拉长测试周期。 The current method has many problems of sub-bit flashed taken: first, the entire sub-bit flash the entire process is done by hand; second, can not accurately determine the program's start and end times, only by manual calculation program approximate execution time, using the experience of the tester to determine whether the correct length of time flashed; third, different sub-bit version, between the different sub-bit configuration modes need to be performed manually flashed; fourth, excessive manual inspection information , the requirements for testing personnel is high, mistakes are inevitable; fifth, to sub-bit multiple times when writing brush, switch between different modes between the different versions, testers to long waiting near the test machine the need to constantly check the initialization information, labor-intensive and lengthen the test period. 第六，无法一次性将所有的测试结果保存到指定文件内，需要反复手动操作，操作起来很麻烦。 Sixth, one-time can not save all test results to the specified file, the need for repeated manual operation, the operation is very troublesome. 鉴于以上内容，有必要提供一种分位刷写系统，测试人员可以不用停留在测试机台旁边，完全摆脱测试人员手动测试，程序自动侦测BMC的分位刷写的开始和结束时间，指定保存文件后，相关的分位刷新信息自动保存，方便测试人员查看。  In view of the above, it is necessary to provide a sub-bit flash the system, the tester can not stay in the next test machine, completely out of the tester manual testing, the program automatically detects the BMC sub-bit flash the start and end after time, specify where to save the file, related to the sub-bit refresh information is automatically saved for easy viewing testers. 鉴于以上内容，还有必要提供一种分位刷写方法，测试人员可以不用停留在测试机台旁边，完全摆脱测试人员手动测试，程序自动侦测BMC的分位刷写的开始和结束时间，指定保存文件后，相关的分位刷新信息自动保存，方便测试人员查看。  In view of the above, there is a need to provide a sub-bit brush writing method, the test can not stay in the next test machine, completely out of the tester manual testing, the program automatically detects the BMC quintile brush and began to write after time, specify where to save the file, related to the sub-bit refresh information is automatically saved for easy viewing testers. 一种分位刷写系统，该分位刷写系统包括：设置模块，用于设置分位刷写的参数，所述分位刷写的参数包括分位刷写的次数；刷写模块，用于根据设置的参数对基板管理控制器的进行分位刷写；判断模块，用于判断分位刷写是否合格；统计模块，用于当分位刷写合格时，对分位刷写的次数进行统计；生成模块，用于当统计的次数与设置的分位刷写的次数一致时，记录每次分位刷写的信息，生成日志文件。  A partial write bit brush system, the sub-bit flash the system comprising: setting means for setting the parameters of sub bit flashed, the partition parameters including the number of bits to flash write quintile brush; flashed means for writing brush according to the parameters set dividing position BMC; a determining module, configured to determine eligibility quintile flashed; counting module configured to write when passing quintile brush for brush writing quintile number statistics; generating module, configured to count the number of times when the sub-bit with the set flashed coincides recording bits per sub information writing brush, generate log files. 一种分位刷写方法，该方法包括步骤：设置分位刷写的参数，所述分位刷写的参数包括分位刷写的次数；根据设置的参数对基板管理控制器的进行分位刷写；判断分位刷写是否合格；当分位刷写合格时，对分位刷写的次数进行统计；当统计的次数与设置的分位刷写的次数一致时，记录每次分位刷写的信息，生成日志文件。  A sub-bit writing brush, the method comprising the steps of: setting parameters quintile (Flash), the sub-bit parameters include the number of partial write brush brush written bits; parameter settings according to the BMC divides the bit flashing; determining quintile flashed eligibility; when quintile flashed qualified on the number of sub-bit flash the statistical; when the same frequency quintiles count the number of times and set brush written record of each quintile brush to write the information to generate a log file. 相较于现有技术，所述的分位刷写系统及方法，首先，测试人员可以不用停留在测试机台旁边，很好的节省了人力和工时投入；其次，完全摆脱测试人员手动测试，程序自动执行；第三，程序自动侦测BMC的分位刷写的开始和结束时间；第四，指定保存文件后，相关的分位刷新信息自动保存，方便测试人员查看。  Compared to the prior art, the sub-bit flash the system and method, first of all, testers can not stay in the next test machine, a very good save manpower and man-hours invested; secondly, to completely get rid testers manual testing, the program automatically performs; third, the program automatically detects the BMC sub-bit flash the start and end time; fourth, after specify where to save the file, related to the sub-bit refresh information is automatically saved for easy viewing testers. 图I是本发明分位刷写系统较佳实施例的应用环境图。  Figure I is a partial write bit brush system of the present invention the preferred application environment of the embodiment. 图2是本发明图I中分位刷写系统较佳实施例的功能模块图。  FIG. 2 is a diagram of the present invention, the write I brush equatorial position system block diagram of a preferred embodiment. 图3是本发明分位刷写方法较佳实施例的流程图。  FIG. 3 is a writing brush quintile flowchart of a method of the present invention the preferred embodiment. 如图I所示，是本发明分位刷写系统较佳实施例的应用环境图。  FIG I, the present invention is a sub-bit write brush application environment of the preferred embodiment of the system of FIG. 其中，该分位刷写系统20运行在计算机2上，该计算机2包括存储器22，该存储器22上存储有各种版本的分位（Firmware),例如,版本为20A的分位,版本为21A的分位等。 Wherein the sub-bit write brush running on the computer system 20 2, the computer 2 comprises a memory 22, the memory 22 stores the various versions of the quintile (Firmware), e.g., for the sub-bit versions of 20A, 21A version the quintile and so on. 该计算机2与安装有基板管理控制器（Baseboard Management Controller, BMC) 10 (以下简称为BMC10)的主板I相连接，以便将存储器22上的不同版本的分位刷写到BMC 10中。 The computer 2 is attached to the BMC (Baseboard Management Controller, BMC) 10 (hereinafter referred to as BMC 10) is connected to the motherboard I for different versions of the memory 22 on the sub-bit flushed to the BMC 10. 在本较佳实施例中，所述计算机2通过反复刷写不同版本的分位到BMC 10中，以便测试BMC 10的分位刷写是否合格。 In the present preferred embodiment, the computer 2 by repeatedly flashed different versions of the BMC 10 to the sub-bit, bit BMC 10 minutes to test the writing brush is qualified. 所述分位刷写系统20的功能将在图2及图3中做详细描述。 The sub-bit write functionality brush system 20 will be described in detail in FIGS. 2 and 3. 如图2所示，是本发明图I中分位刷写系统20较佳实施例的功能模块图。 As shown in FIG. 2 , I is the present invention equatorial position in FIG brush write system block diagram of the preferred embodiment 20 of the embodiment. 该分位刷写系统20包括设置模块210、刷写模块220、判断模块230、统计模块240及生成模块250。 The sub-bit write system 20 includes a brush module 210, a writing brush module 220, a determination module 230, a statistics module 240 and a generating module 250. 本发明所称的模块是完成一特定功能的计算机程序段，比程序更适合于描述软件在计算机中的执行过程，因此在本发明以下对软件描述中都以模块描述。 The present invention is referred to a computer program module is a complete section of a particular function, to be described more programs during execution of software in a computer, and therefore description of the software modules are to be described in the following the present invention. 所述设置模块210用于设置分位刷写的参数。  The sub-bit parameter setting module 210 sets the writing brush. 所述分位刷写的参数包括分位的配置模式，分位刷写的次数，相邻两次分位刷写之间的时间间隔，分位刷写结束后所生成的日志文件保存路径信息等。 The sub-bit write brush configuration parameters comprises sub-bit mode, the number of sub-bits (Flash), two adjacent sub-bit write interval between the time the brush, brush quintile saved path information after the end of the write log files generated Wait. 其中，所述分位的配置模式有两种，分别为用户配置模式及工厂配置模式。 Wherein said sub-bit configuration, there are two modes, user mode configuration mode and configured factory respectively. 所述刷写模块220用于根据设置的参数对BMC 10进行分位刷写。  The brush module 220 is used to write BMC 10 bit is divided in accordance with the parameters set to flash. 具体而言，刷写模块220从存储器22中读取一个版本的分位（例如,版本20A的分位），并将读取的分位刷入到BMC 10中，之后再从存储器22中读取下一个分位（例如,版本21A的分位），并将读取的分位再次刷入到BMC 10，此时，再次刷入的分位代替之前刷入的分位，即版本21A的分位代替已经存在于BMC 10中的版本20A的分位。 Specifically, a brush write module reads from the memory 22 version quintile (e.g., version quintile. 20A) 220, and the sub-bit read brush into the BMC 10, then read out from the memory 22 and then remove a sub-bit (e.g., bit 21A of the sub-version), and partial bit read again into the brush into the brush before the BMC 10, in this case, again, instead of the brush into the sub-bit partial bits, i.e., the version 21A Instead of sub-bit already present in the version 10 BMC quintile 20A. 需要说明的是，刷写模块220每次将分位刷入到BMC 10时，所刷入的分位都将替代BMC 10中已经存在的分位。 Incidentally, the write module 220 each time the brush will be divided into 10 bits brush BMC, the bits are divided into the brush will replace quintile BMC 10 existing. 此外，为了测试分位刷写在不同配置模式下是否合格，刷写模块220还分别在用户配置模式下和在工厂配置模式下进行分位刷写，例如，假设需要在用户配置模式下及工厂模式下各进行50次分位刷写，此时，若在用户配置模式下完成50次的分位刷写之后，将自动切换到工厂配置模式，在工厂配置模式下再进行50次的分位刷写。 Further, in order to test quintile flashed in different configuration mode is qualified, brush write module 220 further respectively dividing position in the factory configuration mode the user configuration mode writing brush, for example, assumed that require the user configuration mode and factories 50 times in each sub-bit mode flashed this case, if after the completion of 50-bit divided in the user configuration mode flashed, automatically switches to the factory configuration mode, mode re-configured in the factory for 50 fractile brush writing. 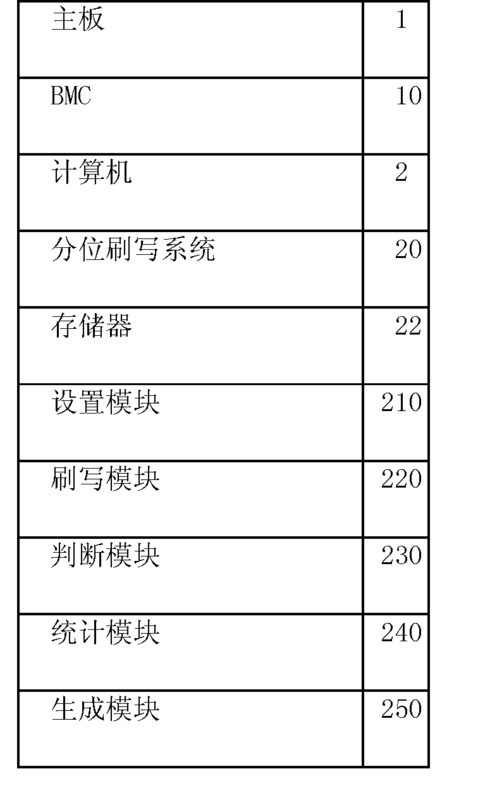 所述判断模块230用于判断分位刷写是否合格。  The determining module 230 for determining eligibility flashed quintile. 具体而言，判断的方式是判断相邻的两次分位刷写的时间间隔是否与设置的时间间隔一致。 Specifically, whether the mode is the two adjacent sub-bit decision flashed whether the time interval consistent with a set time interval. 例如，假设所设置的时间间隔为10秒钟，当用户刷入了版本号为20A的分位到BMC 10时，若启动下一次分位刷写的时间间隔不是10秒钟，则判断模块230判定分位刷写不合格。 For example, assume the set time interval is 10 seconds, when the user brush into the position 20A for the sub-version number to the BMC 10, when the next start bit time division interval is not flashed for 10 seconds, then the determining module 230 determination quintile flashed failed. 所述统计模块240用于对分位刷写的次数进行统计。  The statistics module 240 for the number of times of writing brush quintile statistics. 具体而言，每进行一次分位刷写，统计模块240将次数加一。 Specifically, once for each sub-bit writing brush, a statistics module 240 will add a number of times. 所述判断模块230还用于判断统计的次数是否与设置的分位刷写的次数一致。  The determining module 230 determines whether the number of times for further statistics and Quantile provided flashed coincide. 所述生成模块250用于记录每次分位刷写的信息，生成日志文件。  The generated information bits per sub-module 250 is flashed for recording, to generate the log file. 所述信息包括每次分位刷写的开始时间、结束时间、分位刷写的次数等信息。 The information includes a start time for each sub-bit write brushes, end time, number of times of writing brush quintile. 所述生成模块250按照设置的存储路径将所生成的日志文件保存到存储器22中。 The generating module 250 to set the path memory stores the generated log file in the memory 22. 如图3所示，是本发明分位刷写方法较佳实施例的流程图。  As shown in FIG. 3, the present invention is a writing brush quintile flowchart of a method of a preferred embodiment. 步骤S10，设置模块210设置分位刷写的参数。  In step S10, the setting module 210 sets the parameters of sub bit flashed. 所述分位刷写的参数包括分位的配置模式，分位刷写的次数，相邻两次分位刷写之间的时间间隔，分位刷写结束后所生成的日志文件保存路径信息等。 The sub-bit write brush configuration parameters comprises sub-bit mode, the number of sub-bits (Flash), two adjacent sub-bit write interval between the time the brush, brush quintile saved path information after the end of the write log files generated Wait. 其中，所述分位的配置模式有两种，分别为用户配置模式及工厂配置模式。 Wherein said sub-bit configuration, there are two modes, user mode configuration mode and configured factory respectively. 步骤S20，刷写模块220根据设置的参数对BMC 10进行分位刷写。  In step S20, the write module 220 pairs brush BMC 10 bit is divided in accordance with the parameters set to flash. 具体而言，刷写模块220从存储器22中读取一个版本的分位（例如,版本20A的分位），并将读取的分位刷入到BMC 10中，之后再从存储器22中读取下一个分位（例如,版本21A的分位），并将读取的分位再次刷入到BMC 10，此时，再次刷入的分位代替之前刷入的分位，即版本21A的分位代替已经存在于BMC 10中的版本20A的分位。 Specifically, a brush write module reads from the memory 22 version quintile (e.g., version quintile. 20A) 220, and the sub-bit read brush into the BMC 10, then read out from the memory 22 and then remove a sub-bit (e.g., bit 21A of the sub-version), and partial bit read again into the brush into the brush before the BMC 10, in this case, again, instead of the brush into the sub-bit partial bits, i.e., the version 21A Instead of sub-bit already present in the version 10 BMC quintile 20A. 需要说明的是，刷写模块220每次将分位刷入到BMC 10时，所刷入的分位都将替代BMC 10中已经存在的分位。 Incidentally, the write module 220 each time the brush will be divided into 10 bits brush BMC, the bits are divided into the brush will replace quintile BMC 10 existing. 此外，为了测试分位刷写在不同配置模式下是否合格，刷写模块220还分别在用户配置模式下和在工厂配置模式下进行分位刷写，例如，假设需要在用户配置模式下及工厂模式下各进行50次分位刷写，此时，若在用户配置模式下完成50次的分位刷写之后，将自动切换到工厂配置模式，在工厂配置模式下再进行50次的分位刷写。 Further, in order to test quintile flashed in different configuration mode is qualified, brush write module 220 further respectively dividing position in the factory configuration mode the user configuration mode writing brush, for example, assumed that require the user configuration mode and factories 50 times in each sub-bit mode flashed this case, if after the completion of 50-bit divided in the user configuration mode flashed, automatically switches to the factory configuration mode, mode re-configured in the factory for 50 fractile brush writing. 步骤S30，判断模块230判断分位刷写是否合格。  step S30, the determination module 230 determines eligibility flashed quintile. 具体而言，判断的方式是判断相邻的两次分位刷写的时间间隔是否与设置的时间间隔一致。 Specifically, whether the mode is the two adjacent sub-bit decision flashed whether the time interval consistent with a set time interval. 例如，假设所设置的时间间隔为10秒钟，当用户刷入了版本号为20A的分位到BMC 10时，若启动下一次分位刷写与前一次分位刷写的时间间隔不是10秒钟，则分位刷写不合格，流程进入步骤S60。 For example, assume the set time interval is 10 seconds, when the user brush into the position 20A for the sub-version number to the BMC 10, when the next start time quantile flashed quintile previous time interval is not flashed 10 seconds, the quintile flashed failed, the flow proceeds to step S60. 若启动下一次分位刷写与前一次分位刷写的时间间隔是10秒钟，则分位刷写合格，流程进入步骤S40。 A sub-bit start flashing when the front and a partial bit interval is flashed for 10 seconds, passing the sub-bit writing brush, the flow proceeds to step S40. 步骤S40，统计模块240对分位刷写的次数进行统计。  step S40, the statistics module 240 the number of times of writing brush quintile statistics. 具体而言，每进行一次分位刷写，统计模块240将次数加一。 Specifically, once for each sub-bit writing brush, a statistics module 240 will add a number of times. 步骤S50，判断模块230判断统计的次数是否与设置的分位刷写的次数一致。  step S50, the matching count determination module 230 determines whether the number of statistical points of the written bit set brush. 具体而言，假设设置的分位刷写次数为100次，若统计模块240统计的次数为100次，则说明统计的次数与设置的分位刷写的次数一致，流程进步步骤S60。 Specifically, assuming quintile provided flashed for 100 times, 240 times if statistics are statistics module 100, then the same frequency and the number of quantile statistics provided flashed, the flow advances to step S60. 若统计的次数小于100次，流程返回到步骤S20。 If the count is less than 100 times, the flow returns to step S20. 步骤S60，生成模块250记录每次分位刷写的信息，生成日志文件。  step S60, the generated information bits per sub-module 250 records flashed, generate log files. 所述信息包括每次分位刷写的开始时间、结束时间、分位刷写的次数等信息。 The information includes a start time for each sub-bit write brushes, end time, number of times of writing brush quintile. 所述生成模块250按照设置的存储路径将所生成的日志文件保存到存储器22中。 The generating module 250 to set the path memory stores the generated log file in the memory 22. 以上实施例仅用以说明本发明的技术方案而非限制，尽管参照以上较佳实施例对本发明进行了详细说明，本领域的普通技术人员应当理解，可以对本发明的技术方案进行修改或等同替换都不应脱离本发明技术方案的精神和范围。  The above embodiments are intended to illustrate and not limit the present invention, although the preferred embodiments with reference to the foregoing embodiments of the present invention has been described in detail, those of ordinary skill will appreciate that modifications may be made to the technical solutions of the present invention. or equivalents should not be departing from the spirit and scope of the technical solutions of the present invention. 1. 一种分位刷写系统，其特征在于，该分位刷写系统包括： 设置模块，用于设置分位刷写的參数，所述分位刷写的參数包括分位刷写的次数； 刷写模块，用于根据设置的參数对基板管理控制器的进行分位刷写； 判断模块，用于判断分位刷写是否合格； 统计模块，用于当分位刷写合格时，对分位刷写的次数进行统计；及生成模块，用于当统计的次数与设置的分位刷写的次数一致吋，记录每次分位刷写的信息，生成日志文件。 A brush quintile write system, wherein the sub-bit flash the system comprising: setting means for setting the parameters of sub bit flashed, the sub-bit parameter including writing brush writing brush quintile number; brush write module, according to the parameters set dividing position BMC flashed; determining means for determining eligibility quintile flashed; counting module configured to flash when passing quintile , the number of times of writing brush quintile statistics; and a generating module configured to count the number of times when the sub-bit with the set flashed coincides inch, each quintile flashed recording information, generate a log file. 2.如权利要求I所述的分位刷写系统，其特征在于，所述分位刷写的參数还包括分位的配置模式、相邻两次分位刷写之间的时间间隔及分位刷写结束后所生成的日志文件保存路径信息。 2. The sub-bit I according to claim brush write system, wherein said sub-bit write parameter further comprises a brush quintile configuration mode, two adjacent sub-bit write interval of time between the brush and quintile brush path to save log files generated after the end of writing. 3.如权利要求2所述的分位刷写系统，其特征在于，所述判断的方式是判断相邻的两次分位刷写的时间间隔是否与设置的时间间隔一致。 3. quintile brush according to claim 2 write system, wherein the determination of whether the mode is determined two adjacent sub-bit flashed interval consistent with the set time interval. 4.如权利要求2所述的分位刷写系统，其特征在于，所述生成模块按照设置的存储路径对所生成的日志文件进行保存。 The sub bit as claimed in claim 2, brush write system, wherein the generating module according to the storage path provided on the generated log files saved. 5. 一种分位刷写方法，其特征在于，该方法包括步骤： 设置分位刷写的參数，所述分位刷写的參数包括分位刷写的次数； 根据设置的參数对基板管理控制器进行分位刷写； 判断分位刷写是否合格； 当分位刷写合格时，对分位刷写的次数进行统计'及当统计的次数与设置的分位刷写的次数一致吋，记录每次分位刷写的信息，生成日志文件。 A method of sub-bit writing brush, characterized in that, the method comprising the steps of: setting parameters quintile (Flash), the sub-bit parameters include the number of partial write brush brush write bit; parameter settings according to of the baseboard management controller quintile flashing; Analyzing quintile flashing is qualified; when quintile flashed qualified, the number of times quintile flashed statistical 'and when the sub-bit count number provided brush write times consistent inch, each recording bit sub information writing brush, the log file is generated. 6.如权利要求5所述的分位刷写方法，其特征在于，所述分位刷写的參数还包括分位的配置模式、相邻两次分位刷写之间的时间间隔、分位刷写结束后所生成的日志文件保存路径信息。 6. quintile brush of claim 5, wherein the writing method, wherein said sub-bit write parameter further comprises a brush quintile configuration mode, two adjacent sub-bit write interval between the time the brush, quintile brush path to save log files generated after the end of writing. 7.如权利要求6所述的分位刷写方法，其特征在于，所述判断分位刷写是否合格的方式是判断相邻的两次分位刷写的时间间隔是否与设置的时间间隔一致。 7. The sub bit according to claim 6 brush writing method, wherein said determining eligibility quintile flashed way is determining whether the two adjacent sub-bit interval and flashed set intervals consistent. 8.如权利要求6所述的分位刷写方法，其特征在于，该方法还包括步骤： 将生成的日志文件按照用户设置的存储路径进行保存。 The sub bit according to claim 6, writing brush, characterized in that the method further comprises the steps of: generating log files maintained according to the storage path set by the user.